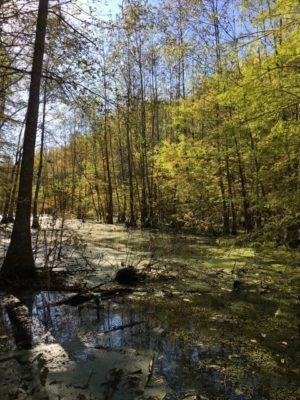 Round Pond Sanctuary totals 347 acres and was acquired in 2018 with the help of a purchase grant from Illinois Clean Energy Community Foundation and funds from the Illinois Audubon Society’s Land Acquisition Fund. Located in Pope County, the property lies in the Coastal Plain Natural Division of Illinois in an ancient channel of the Ohio River. 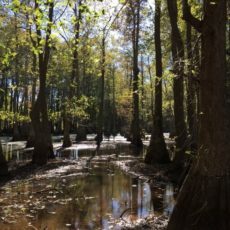 This wetland rich area contains high quality bottomland hardwood forests and deep water swamps with old growth bald cypress and tupelo gum timber. The tract borders an existing 206 acre Illinois Nature Preserve owned by The Nature Conservancy. The Society’s purchase of Round Pond Sanctuary protects all of the land associated with the Round Pond Natural Area. The Illinois Audubon Society plans to provide public access to the site and is currently developing a public use plan. Round Pond provides habitat for a variety of breeding birds of forested wetlands, such as the Swainson’s warbler and also includes a heron rookery. 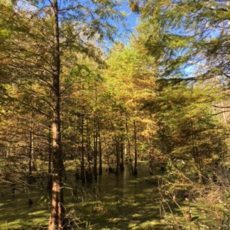 Several rare plants also are known from the site including water hickory, American snowbell, winged sedge, cypress-knee sedge, swollen sedge, narrow-leaved sunflower and narrow-leaved crabapple.